Devil's Island In 2004 (my travel diary says it was on March 5), the Caronia was supposed to stop at Devil’s Island after having come up the Brazilian coast on the way back, via islands, to Fort Lauderdale, Florida. It pulled relatively close to Île Royale, one of the three islands in the grouping (described below), so that we could see from a slight distance something of the settlement. Apparently there isn’t too much to see, since no tours were offered (then or now), and, as you know, if the cruise companies could make a buck, there’d be a tour. However, there’s no dock there, and visitors have to tender in. As it turns out, the seas were much too high to actually chance sending a tender in, and so the stop was cancelled, and off we sailed to the next stop. I had the feeling at the time that, even without having been able to walk around, having seen them from nearby, I had a sense of the remoteness of these islands as a place of exile, both off the South American coast and from France and all Europe. This trip, once the Regatta left the Amazon and turned sharp left (NW) toward the three Guianas, the waters along northern South America proved to be rather bumpy once again in this direction as they had been when sailing in towards the Amazon, and those little bags were left out again in public places. I began to think that “lightning might strike twice” in the same place, and unfortunately, so it did. The next morning we were scheduled to dock for the day at Devil’s Island (I presume Île Royale again) and at 8 AM, the captain made the announcement that the seas were too high for tendering in, our safety was paramount, blah, blah, blah, and we wouldn’t be stopping, but instead would be moving on to Barbados. This time, when I looked out to sea, I could only barely see the islands on the horizon, so he hadn’t even tried to get too close, which means my first trip there was just a bit more successful than this one. I now have two bolts of lightning in my suitcase. Nevertheless, based upon my first, close-up visit, through which I still feel a historical attachment to the area, I still wish to discuss the islands, the penal colony, and most of all, Devil Island’s most famous prisoner, Alfred Dreyfus, and how the Dreyfus Affair altered world history then, and still has a bubbling-up affect now. 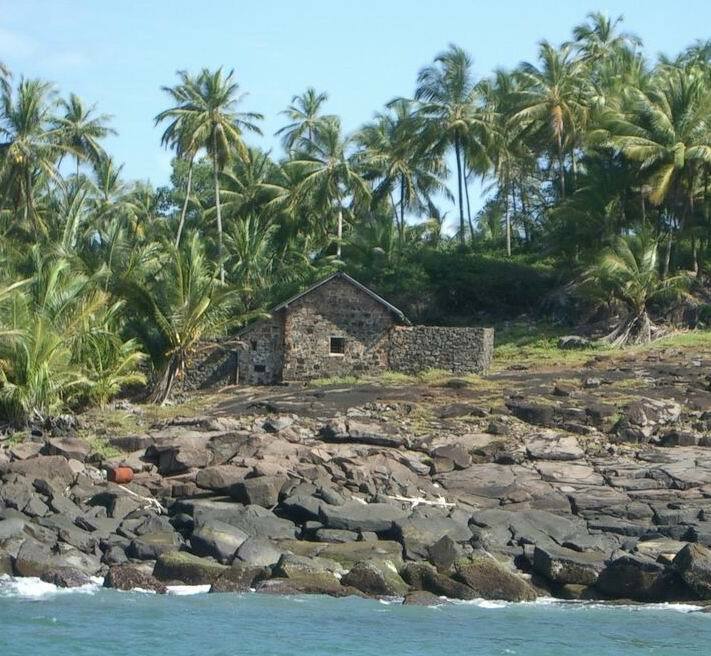 Coming from the Amazon and passing Cayenne, one reaches the three Îles du Salut (Portuguese: Ilhas da Salvação; Spanish: Islas de la Salvación; English: Salvation Islands), which lie about 11 km (7 mi) off the coast. Think of the irony of the name of these islands, given that they became a prison colony. The smallest of the three and furthest from the coast is Île du Diable (Portuguese: Ilha do Diabo; Spanish: Isla del Diablo; English: Devil’s Island). Bringing to mind British convict deportations to Australia, Devil’s Island is famous for being a penal colony for exactly a century, from 1852-1952. Some 80,000 convicts were deported up until 1939 to one of the most infamous prisons in history, known for its harshness and brutality. Political prisoners were deported to the disease-infested colony as well as hardened criminals, such as thieves and murderers. Other than by boat, the only way out was through dense jungle, so escape was close to impossible. From early on, laws were passed requiring released convicts to then spend the equivalent of their prison sentence in French Guiana to bolster the local population, or, for sentences over eight years, or for repeat offenders, for the rest of their lives, in which case they were provided with land. However, the public perception of where the camp was is not exactly accurate. The penal colony was not located just on Devil’s Island itself, but also the other two islands, Île Royale and Île Saint-Joseph, as well as adjacent areas of the mainland of French Guiana. All these locations are known collectively as Devil’s Island. On this basis, both ships I was on had been scheduled to stop at Île Royale, which presumably has the best tendering connections. This makes me wonder if any traveler actually gets to stop on Devil’s Island proper. By far the most famous resident of Devil’s Island was Alfred Dreyfus. The caption of the picture I’ve found says it shows where Dreyfus lived on Devil’s Island. I accept that, but, with the knowledge we now have of that being a collective designation, is it located literally on Devil’s Island, on Île Royale, or elsewhere? If I had set foot on Île Royale--and not Devil’s Island literally--could I have seen it or not? In the long run, I’m rather comfortable with having seen the general setting of the penal colony, and mind less missing the details. The Dreyfus Affair Being “at” Devil’s Island makes it well worth reviewing l’Affaire Dreyfus / the Dreyfus Affair. Just as in the case of Saint Barts and the Teatro Amazonas in Manaus, English-language sources were not sufficient for some of the more interesting details, and sources in other languages were needed. Some of the best details below that I’d never been aware of before were gleaned from French Wikipedia. Before I learned about the affair in history class, I’d seen on TV the excellent 1937 film The Life of Émile Zola with Paul Muni in the title role. The reader might know some superficial aspects of the case: French Jewish army officer falsely accused of treason, sent to Devil’s Island, famed novelist Émile Zola rights the miscarriage of justice. But just when did it happen? How serious was it for France and the world? How did it affect Zola’s career? Who really wrote the famous newspaper headline? What affect did the affair have on WWII? What lasting effects did the trial have, even to this day? There’s more here than meets the eye at first sight, and it took some digging to find the aforementioned details. The Dreyfus Affair was a political scandal that divided France in the two decades straddling the turn of the 20C, which by pure and unrelated coincidence was the same time as the Amazon rubber boom. In 1894, Colonel Alfred Dreyfus, a young French Jewish artillery officer, was convicted of treason in a court-martial for allegedly having sold French military secrets. He was sentenced to life imprisonment in Devil’s Island and put into solitary confinement there in early 1895. Two years later, evidence came to light identifying the real culprit, but high-ranking military officials suppressed this evidence. In addition, false documents were fabricated meant to reconfirm Dreyfus’s conviction. Some of Dreyfus’s supporters tried to get the right-wing French government to overturn the conviction, to no avail. At this point, there came into the picture Émile Zola, shown here in Édouard Manet’s 1868 portrait of him; this is a photo of Zola in 1898, at the time of the affair. Zola was an established, well-known, and influential author, but was prepared to risk his career. He wrote an article on the affair that he first brought to the oldest, and (today) second-largest daily in France, Le Figaro, but they were (and still are) a conservative paper and didn’t want to alienate their readership. Zola then turned to the liberal daily, L’Aurore, whose publisher agreed to print the article. The publisher was the journalist Georges Clemenceau, also shown here in a portrait by Édouard Manet. To emphasize the level of importance of these participants and events, Clemenceau later became Prime Minister of France from 1906-1909 and 1917-1920. Zola’s article, which appeared just 48 hours after the verdict, striking while the iron was hot, was in the form of an open letter to the President of France, with the simple and direct title Lettre au Président de la République / Letter to the President of the Republic. L’Aurore published the open letter on its front page on 13 January 1898, accusing the highest levels of the French Army--and naming names--of a gross miscarriage of justice, specifically obstruction of justice and anti-Semitism for Dreyfus’s wrongful conviction. The dramatic headline chosen by Clemenceau and his editor, appearing in larger print above Zola’s more mundane title, became one of history’s most famous: J’accuse . . . ! / (I Accuse . . . !) The 300,000 copies sold out in a few hours. 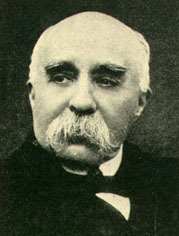 Clemenceau took an active part as a supporter of Zola and an opponent of the anti-Semitic and nationalist campaigns. All in all, he published 665 articles defending Dreyfus during the affair. It must be emphasized how incredibly the Dreyfus Affair divided France. This political cartoon appeared in 1898 and is called Un dîner en famille / A Family Dinner (click to enlarge). The caption of the upper picture is: --Surtout ne parlons pas de l’affaire Dreyfus! / “Let’s be sure not to talk about the Dreyfus affair!”. That of the lower one says Ils en ont parlé. / They talked about it. Zola was brought to trial for criminal libel, convicted, and sentenced to jail for one year plus a maximum fine (paid by an admiring journalist). He had to flee to London to avoid jail, but was then allowed to return, just in time to see the government fall. The Dreyfus Affair divided France deeply between the reactionary army and church and the more liberal commercial society. It became one of the most tense political dramas in modern French and European history. Since Zola was a leading French thinker, his letter was a turning point that contributed to the political liberalization of France. Dreyfus was pardoned and released from Devil’s Island in 1899 after about four years. He was fully exonerated on 12 July 1906 by the Supreme Court, readmitted to the army the next day and made a Knight of the Legion of Honor the next week. He served throughout World War I, and in 1918 was raised to Officer of the Legion of Honor. He died on 12 July 1935, 29 years to the day of his exoneration. This picture shows Dreyfus in the last year of his life. The American actress Julia Louis-Dreyfus is a distant relative of Alfred Dreyfus. Zola died in 1902, so he experienced Dreyfus’s release three years earlier but not his exoneration four years later. He died at age 62 of carbon monoxide poisoning caused by a stopped chimney. His enemies were blamed because of previous attempts on his life, but nothing could be proven. Decades later, a Parisian roofer--a roofer no less, who works adjacent to chimneys--claimed on his deathbed to have stuffed up the chimney for political reasons. Still, nothing definite is known, other than the fact that Zola died an unusual death at a relatively young age. Zola’s 1898 article is widely marked in France as the most prominent manifestation of the new power of intellectuals, such as writers, artists, and academicians, in shaping public opinion, the media and the state. 1)	It was a major influence on crusading journalism everywhere. 2)	In France, the moderate liberals persevered, and a 1905 law separated church and state. However, the far right remained a potent force, but was pushed further to the fringe. Still, remnants of the anti-Dreyfus faction and their descendants during WWII went on to be part of the Vichy Regime, which eventually arrested Dreyfus’s granddaughter, who died at Auschwitz. 3)	The Hungarian Jewish journalist Theodore Herzl covered the affair, and went on to found the World Zionist Organization. The Dreyfus Affair was a major factor convincing him that Jews could not assimilate and get fair treatment, and needed their own state. 4)	At the turn of the 20C there were two sports magazines, one pro- and one anti-Dreyfus. The anti-Dreyfus magazine saw its circulation declining because of its policies, and in 1903 started a new long-distance bicycle race to help boost circulation of the magazine, a race that had longer distances and better prizes than any previous race. That race was the Tour de France. 5)	I am informed that the Dreyfus Affair played a significant role, especially in volumes 3 and 4, of Marcel Proust’s Á la recherche du temps perdu / In Search of Lost Time (also known in English as Remembrance of Things Past [2010/2]). 6)	On 12 July 2006, President Chirac held an official state ceremony marking the centennial of Dreyfus’s rehabilitation in the presence of the living descendants of Zola and Dreyfus. The French National Assembly also held a memorial ceremony on that date. 7)	On the centenary of Zola’s 1898 article, France’s Roman Catholic daily paper Le Croix apologized for its antisemitic editorials during the affair. 8)	In 1985, President François Mitterand commissioned a statue of Dreyfus by Jewish sculptor Louis Mitelberg to be installed at the École Militaire / Military School, but the Minister of Defense refused to display it, even though Dreyfus had been rehabilitated into the Army and fully exonerated in 1906. It was installed instead on the Boulevard Raspail. Barbados We should now look again at the Caribbean map (click to enlarge) we used southbound in order to locate the upcoming islands we’ll stop at northbound. Barbados, with Bridgetown on its SW side, stands completely surrounded by the Atlantic Ocean, not the Caribbean Sea, well to the east of the gentle arc of the Lesser Antilles. It’s a highly developed, leading tourist destination and the most developed island in the region and an independent country in the British Commonwealth. Before it became an English possession in 1625, it had been settled by the Portuguese, on their way to Brazil, with the name Os Barbados, meaning The Bearded (Ones). While the bearded ones might have been allegedly bearded Carib natives on the island, it also could have referred to the long, hanging roots of the Bearded Fig Tree, native to the region, which is a species of banyan. Knowing the banyan tree, and picturing its hanging aerial roots, I find it amusing how that sort of thing might have given its name to Barbados. It is noteworthy that, although the Portuguese stopping here, but sailing on to Brazil gave this English-speaking island its name, there are no Portuguese-speaking islands in the West Indies. Bridgetown is the only city outside continental North America that George Washington ever visited. George Washington House, the house where he stayed, is now part of the Garrison Historic Area. The body of water in the center of town is called the Careenage, and was spanned by a bridge even in pre-settlement times, hence the name Bridgetown. The picture shows the Chamberlain Bridge spanning the Careenage in Bridgetown. On the Deutschland (2004/20) we stopped at, and therefore are now repeating, Saint Lucia southbound, and Barbados and Dominica northbound. I like Barbados, but this is my fourth time here, and it’s beginning to feel like I’m commuting. We were in Barbados on the Nieuw Amsterdam years ago, and in 2004, I was here actually twice, first early in the year on the Caronia coming up from around South America, then later in the year on the Deutschland traveling around the Caribbean. Barbados is nice the first few times, but I instead I had a fine ship day reading and working. Life on Board During the 3 ½-week trip, I only ate five dinners total at the three sit-down restaurants. All other meals, including dinners, were at the buffet restaurant, which also includes sit-down service for beverages and other services, and is also the only restaurant with a large outdoor terrace in the back, overlooking our wake, which is beautiful in nice weather. There’s a maître d’ from Greece named Giorgios who enjoys coming over and making sure I’m happy. Here, as well, I’ve either enjoyed sitting with friends or having a chat with nearby diners. Our trivia team, which I named on the first day “Number One”, continued to “rule”. We had in the afternoons 8 to 12 teams of about eight players daily and, even given frequent multiple winners in 1st (3 points), 2nd (2 points), or 3rd (1 point) place, our team only three times in 3 ½ weeks ended up completely out of the running with no points at all. One day I was involved in a trifecta of first places, for nine points. At the usual 4:30 Team Trivia in the Regatta Lounge, we were doing well, but there was one answer that was on the tip of my tongue that I couldn’t get. Who was the character that tried to lead Pinocchio astray? It’s also the name of a volcano. (Once we got the answer, I added that it’s also a savory pastry you can buy in an Italian deli.) I knew it started with an S, and couldn’t get it. Then, when player Margaret said “Stromboli”, I got so excited I gave her a big hug. At 9:00 that evening, in the Martini Bar, we as usual participated in the faster, shorter and less exciting “Brainteasers”, and came in first again. I figured that was it for the day, but player Bruce felt he wanted to hang around in Martini’s for the first time ever until the 10:30 “Name that Tune”. I said if he’s staying, so am I, and it turned out that the two of us were the only ones from Number One that did. I wasn’t expecting much, since two other teams each had 4-5 players. The rather long game involved identifying traditional popular songs and composers, or movie songs and movies, or Broadway songs and shows, so there was a possibility of a rather high 44 answers. We both were doing well with many songs, although Bruce really shone. For instance, under popular songs, he was able (I wasn’t) to name that popular Brazilian bossa nova song as “Desafinado” and he knew it was by Jobim; in shows, we both identified “Stranger in Paradise”, but I knew it came from “Kismet”. We worked exceptionally well together, although Bruce still had the edge. When it was over, 3rd place went to a team with 26/44, second to 27/44, and our team of two ended up smoking them all with 37/44. I had suspected we’d done somewhat well, but I was literally stunned when I saw we were a full ten points above the second team, giving these two members of Number One a First-Place Trifecta for the day. I must have been on a roll, since I won the daily quiz the next day, except I don’t think too much of it. Ten printed questions appear on a sheet in the morning, to be turned in by evening. I’m sure too many people look up the answers, so I discount the validity of the quiz. I only did it twice, but the second time I won (a three-way tie) for three points, even though I only got 7 out of 10. The category was “Ocean World”, and, for example, I did get the area of the western Atlantic that gets its name from a kind of seaweed as the Sargasso Sea. But when it asked for the largest US island, I was swayed by what I’d said about Long Island on this website, and chose that, but afterward realized that was the largest island in the CONTINENTAL US. The biggest overall US island is the Big Island of Hawaii. All in all, I exchanged my points for a blue teeshirt, but it was the fun of playing. Dominica To visit Dominica (do.mi.NI.ca) we had to cross over to its Caribbean side, where the capital, Roseau, is. Dominica was named by Columbus for the day of the week he spotted it. The name is Latin for Sunday, although stressed differently. As mentioned above, I stopped here on the Deutschland, so this is my second time, which is two times too much. I know the cruise line was using this stop as a filler, to bulk up its itinerary. Let me put it this way: Dominica makes you yearn for Saint Lucia. I again stayed on the ship. This somewhat attractive picture of Roseau was wisely taken from a distance. I know, I need to be more charitable. But once again, the “vacationers” enjoyed the snorkeling, the river rafting, the waterfalls, blah, blah, blah. One vacationer actually said it was the best stop on the trip. Virgin Islands The Virgin Islands are divided between the US Virgin Islands (USVI) and the British Virgin Islands (BVI). All but the largest island lie in an east-west cluster. The principal USVIs in this cluster are Saint Thomas and Saint John, directly followed by the BVIs Tortola and Virgin Gorda, as well as others. Further to the south is the largest Virgin Island, the USVI of Saint Croix, lying somewhat out of the grouping. The Virgin Islands, like so many others, have the Caribbean Sea on one side, but the Atlantic Ocean on the other. In both the USVI and the BVI (1) the US dollar is used; (2) cars drive on the left; (3) nevertheless, the steering wheel is ALSO on the left. The unusual name for the islands is religious in origin. Columbus named them for Santa Ursula y las Once Mil Vírgenes / Saint Ursula and the Eleven Thousand Virgins, later shortened to Las Vírgenes / The Virgins, and then down to the present variation. US VIRGIN ISLANDS The Regatta didn’t stop in the USVI (although we saw them in the distance), but the only comment I want to make is to point out the other Scandinavian connection in the West Indies besides the former Swedish ownership of Saint Barts and the Swedish origin of the name Gustavia. While we now have the US and Britain on the scene in the Virgin Islands, we once had Denmark and Britain. Apparently, the only constant here is Britain. The USVI were formerly the Danish West Indies. The Danish West India Company settled on Saint Thomas in 1672, on Saint John in 1694, and purchased Saint Croix from France in 1733, which explains the French name of that island (Saint Croix means Holy Cross). The islands became royal Danish colonies in 1754 under the name De dansk-vestindiske øer / The Danish West Indian Islands. By the end of the 19C, the islands became a drain on the Danish treasury, and Denmark tried several times to sell them to the US. They were finally sold, with the impetus of WWI, by the Treaty of the Danish West Indies of 1916, which had to be ratified by a Danish plebiscite. Danish influence remains in the USVI in city names. The capital, located on Saint Thomas, is Charlotte Amalie, named after Charlotte Amalie of Hesse-Kassel, queen consort to King Christian V of Denmark. Two towns on Saint Croix also have Danish names, Christiansted and Frederiksted. BRITISH VIRGIN ISLANDS In 2004, the Deutschland (2004/20) stopped in Road Town, Tortola, BVI, allowing me to achieve my 100th Travelers Century Club destination, the BVI, and I became a TCC member shortly thereafter. This trip, the Regatta also stopped in the British Virgin Islands, but this time at its other major island, Virgin Gorda. This view is west toward the other Virgin Islands, both US and British; Spanish Town is in the center and The Baths (see below) are to the left at the end of the peninsula. Of all the Virgin Islands, only Virgin Gorda uses the word “virgin” in its name. It’s said that Columbus thought the profile of the island looked like a fat woman, and he named the island Virgen Gorda / Fat Virgin. Modern usage changes the first word to the English version, but then maintains the second word in Spanish. This is a sunset at Virgin Gorda, again, with other Virgin Islands to the west. 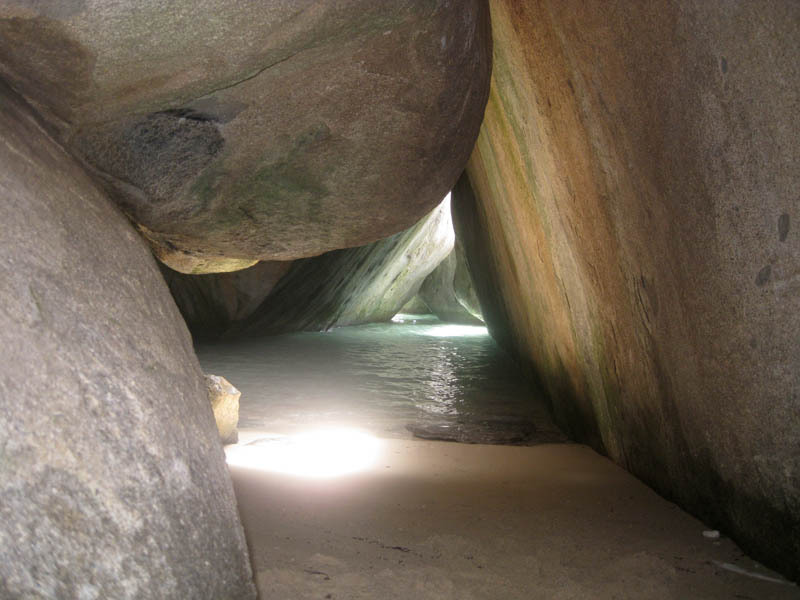 “The Baths” are unique geologic formations on Virgin Gorda, today within a BVI National Park, consisting of massive granite boulders on a beach. The beach shows evidence of the island's volcanic origins, where granite was deposited on the beach that eroded into piles of boulders. The boulders, which are up to 12 m (40 ft) in size, form natural tidal pools, caves, tunnels, arches and scenic grottoes open to the sea. Sometimes a sandy path suddenly becomes a tidal pool (watch your head!). Note the areas of sunlight entering between boulders, and twist your way around this projecting rock while walking in water and avoiding people coming at you. The previous paragraph is the research I’d done, and it was perfectly accurate and correct, which made me want to do a--for me--very rare beach visit. In other words, this beach was unusual enough for me to go see it. It would involve taking a taxi after getting off the tender, and a trivia friend, Bill, who’d been to The Baths several times before over the years, said he’d go along with me. He turned out to be my mentor. Dickens had it right in A Tale of Two Cities: It was the best of times, it was the worst of times . . . Seeing the unusual rock formations and the surprise ocean views between them was certainly worth it (“the best of times”), but every step along the way I wondered if I’d make it to the far end at Devil’s Bay, and once there, if I’d ever get back (“the worst of times”). It wasn’t really a beach visit, but a “cave” visit, but still I took a bag along in which to carry the new sandals I’d just bought in Tampa, along with a towel and sunscreen. We were also dressed normally, in shorts and tees. We went down a long staircase to the beach, and entered the “cave”, which is really just walking through, over, under, and between these huge boulders. Sometimes you were almost down on your knees to squeeze through an A-shaped passageway, then you’d walk through a cave-like area with seawater above your ankles. Wooden ladders had been installed, and in some places thick cables for guidance, but everything was covered by wet sand, and didn’t offer the best handhold or footing. In addition, you keep meeting people coming back in the other direction, causing traffic jams. If Bill hadn’t been leading the way, nice as the setting was, I wonder if I’d gone the whole distance. Still, it was enjoyable to “have done” it, something like having seen Fitzcarraldo. I told people afterwards, if they give certificates for crossing the equator, I want a certificate for walking the length of The Baths! Late that afternoon our whole trivia team went to the Horizons Lounge up top for two-for-one happy hour and to watch us sail our way between both the British and US Virgin Islands. Dominican Republic From the Virgin Islands, we cut over to the Samaná peninsula of the Dominican Republic to make a beach stop south of the peninsula at Cayo Levantado. Another filler. ‘Nuff said. Bahamas We then sailed again alongside Cuba and turned into the Bahamas, which consist of some 29 larger islands, and many smaller ones. Although considered by the geographically challenged to be in the Caribbean, the Bahamas are clearly located in the Atlantic. The most populous island, though small in size, is New Providence Island, which includes the capital city of Nassau, allowing the island to function similarly to a capital district. Nassau was named after the Dutch prince who became the British King William III, who was of the house of Orange-Nassau. Nassau County in New York is named for him as well. Nassau’s growth began in the 1780’s after the American Revolution, when thousands of American Loyalists arrived here, and further increased after 1807 when the British abolished the international slave trade and formerly enslaved Africans settled here, both groups eventually outnumbering the original inhabitants. Most of New Providence Island was uncultivated bush when the Loyalists arrived and established several plantations. Today, Nassau accounts for 70% of the entire population of the Bahamas. A building such as Government House, official residence of the Governor-General of the Bahamas since 1801, demonstrates a mingling of (Loyalist) American Colonial architecture and Bahamian-British architecture. The columns and circular drive reflect the architecture of Virginia and the Carolinas, while the pink color, alternating with white, and louvered wooden shutters are typically Bahamian. The Bahamian Parliament is similar in style. Key West in Florida is known for its Bahamian influence, both in population and in architecture. This is because, after Loyalists and blacks fled to the nearest British soil after the Revolution, afterward many in the next generation wanted to come back, and chose Key West. In addition to the pink government buildings, there were some colorful residences as well, including the colonial Balcony House from the 18C, the oldest wooden structure in Nassau. The Anglican/Episcopal cathedral was also a handsome structure. One of our first trips many years ago was to Nassau, and we were then attracted to the British Colonial Hotel right next to the center of town, which brings back memories. It’s now been restored, and is the British Colonial Hilton. The historical plaque said that the first hotel there was the Colonial, built in 1900 by none other than Henry Flagler, who built so many Florida hotels for his Florida East Coast Railway, the “Railroad that Goes to Sea” out to Key West. As mentioned in 2008/7, he also had business interests in the Bahamas, and the original of this hotel was an example. The Flagler hotel had been of wood, and burned in 1922, and it’s the replacement that’s been refurbished. The lobby is still elegant, as is the garden in the back, which leads to the hotel’s small but very adequate private beach right next to downtown, a particular attraction to us those years ago on our first visit. It is not far from the Bahamas to Miami, whence we returned the next morning. The majority of people had airport connections, and I was amused at the lines they were waiting on outside the terminal. There were airport buses so “generously” provided by the cruise line at $75 a person (they try to get you wherever they can), and a long, slow-moving line of people waiting for taxis. I walked around the corner to the Metrobus stop (for the bus that hadn’t run on weekends on my arrival, so I had to take a taxi then), got to Metrorail to Douglas Road, and then Metrobus again to the airport for my flight back to New York. At $2 for each connection, it cost me $6 and took a little over an hour, even with the connection time. It isn’t so much the money, it’s the feeling of accomplishment for being wise enough to use the transportation system to one’s advantage, as I do at most airports. I can understand that a wheelchair or walker indicates taking a taxi--been there, done it. As for those having piles of luggage, shame on them. They should learn how to travel. I manage very well using one wheeled, carry-on bag. On the other hand, I’m sure there are those that feel that one must go in style by taxi when connecting to a la-di-da cruise. At any rate, while I was waiting at the bus stop, who should come ambling by but Peter Mezoian, the banjoist. He was planning on strolling into Miami (it isn’t really far over the bridge to Biscayne Boulevard) to spend the day. Good for him. Frankly Speaking It was all in all a good trip. The central segment on the Amazon was outstanding, but that was of course the whole purpose of the trip. I was pleased with some island stops, especially Saint Barts, but most of them could have been eliminated, making this trip an Amazon specialty, and leaving the islands for a separate trip for those who want them. I still remain astounded at the number of vacationers on board (even many “retired ‘vacationers’”, which is an oxymoron if I’ve ever heard one), and the paucity of genuine travelers, but that’s what you get by booking what’s touted as a cruise as opposed to sailing to a set destination, such as on a transatlantic crossing or sailing among the islands of Tahiti or Hawaii. But how else can you sail up and down the Amazon? I really have to state after considerable introspection that I dislike many if not most cruise lines, the “vacation” atmosphere they engender, and the mentality of so many (but far from all) of the people they attract. (At least the upscale cruise lines don’t attract the tattooed crowd.) Ideally one would take a voyage that attracts people with a destination in mind who have minimal interest in vacationing on the way--and by that I mean rubber rafting, horseback riding, snorkeling, yada yada yada, which to my mind should be specialized trips of their own for those that want it. But that’s hard, so you have to live with the cruise lines, or not sail anywhere, which would mean not being able to see the reflection of the moon on the sea on one of the last nights of this trip, or the hazy, slow sunset at sea on another evening. I’ve been thinking about it, and the most memorable voyage I can recall was in 2006, two nights on the Finnhansa (2006/9 “Finnhansa”) across the Baltic from Finland to Germany. It was the most peaceful, restful trip, with an excellent cabin, fine food (smörgåsbord) and beautiful sea views. The Finnhansa is technically a regularly scheduled car ferry (!!! ), but it functions like a freighter, and is a great way to go. Why can’t something like that go from Miami to Manaus? Well, not in this day and age, I suppose. Peter Mezoian, Banjoist I do have to say that the Regatta had on board a wonderful string quartet, which would regularly be set up at certain locations (at tea time, or in the lobby) for one’s enjoyment. Also, pianist Adam played an amazingly good number of selections in the Martini Bar, including the Name that Tunes evening. Much of the other entertainment (two magicians, not-so-great comedians, singers), were so-so, until after Barbados, with Peter Mezoian came on board (his is an Armenian name). Peter is a master banjo player, and his work is outstanding. I loved both of his shows and wish I could see more, since he’s staying on after Miami until Bermuda. One piece he featured was a simulation of four banjos playing at the same time. In the past I’ve struck up on-board acquaintanceships with some entertainers on ships, including comedian John Martin, and the morning after Peter’s second show, Peter and I had a late breakfast together. We talked for over two hours, after they closed down the buffet area for breakfast and sat there until the lunch people started to come in. Later, I was having lunch with some people and he stopped by again and several of us had a talk of over an hour. For the most part, we did straight travel talk, particularly about ship travel, but not exclusively. Peter is from Portland, Maine, and has a great deal of interest in Québec City, and we discussed the Northeast in general quite a bit. I may visit Québec later this year, and I’ll keep in mind some of the pointers Peter gave me. I also invited him as my guest to our trivia session that day. The very last night before Miami Peter joined several of us for dinner for more travel conversation. What I enjoyed about talking to Peter is that his travel interests coincide so well with mine. It was interesting to find out how he works as an independent contractor--and has for 21 years--and to hear about his adventures in making proper connections to be on the right ship at the right time, and how he tries his best on flights to keep his banjo with him in the overhead compartment. I learned from him that he plays the four-string banjo, which is less common than the five-string. He also refers to it as a plectrum banjo, since he uses a pick. It was interesting to hear how, although the banjo repertoire falls heavily into the 1920’s and 1930’s, Peter feels he has to cater more to a younger crowd (not on THIS ship!!! ), and so included some Stevie Wonder in his shows. He also perceives more Spanish speakers being a potential audience and wonders about catering to them. Peter is of small stature and gives a VERY youthful appearance. From across the room during his act, I at first wondered if he were still a teenager; when he came closer, I said OK, maybe he’s thirty, but it turns out he’s 44. (If only I could pull that off.) It’s his small stature that helps, and he jokes about it in his act: “Life is short--and so am I!” He does a great stand-up repartee between selections, which led to my finding out about how he got started. He always admired Steve Martin, and Peter wanted to do stand-up. But Steve Martin also occasionally plays the banjo in his act, and that let Peter to start studying that instrument, then allowing it to be the centerpiece of his act, but an act that still included comedy. Peter’s website, which is quite good, is simply: peterbanjo.com (click here). I suggest the reader review it, including some of the video clips he has, not only on the home page, but also under “Videos”. Take a look at the clip of him playing the Finale from the William Tell Overture, or Broadway show tunes, or Joplin rags or Duelling Banjos, and you’ll get an idea of his expertise. Watching Peter’s shows and meeting him for long travel talks was a most enjoyable part of this trip, proving once again that you never know what fortune travel will bring. Quotes On the trip north, I’d left the most interesting regions behind and had caught up with website writing, even getting a little ahead in putting together factual information done six months ago on upcoming stops. I always had left time aside for reading and team trivia, and then found I’d achieved the point of Dolce far niente / [It’s] Sweet Doing Nothing that the vacationers on board had been doing from the beginning. I went to the library and discovered The Oxford Dictionary of 20th Century Quotations, then found an area on deck not only sheltered from the wind but also sheltered from the sun that had large bed-like lounges facing the window wall and the sea. I then perused the quotes and selected a few that I liked, both humorous and serious. House Beautiful is play lousy. GOOD WORK, MARY, WE ALL KNEW YOU HAD IT IN YOU. You mean apart from my own? That’s the way with these directors, they’re always biting the hand that lays the golden egg. If people don’t want to come out to the ball park, nobody’s going to stop ‘em. I don’t want to achieve immortality through my work . . . I want to achieve it through not dying. I’ve been in Who’s Who, and I know what’s what, but it’ll be the first time I ever made the dictionary. I used to be Snow White . . . but I drifted. I’ve been things and seen places. It’s not the men in my life that counts, it’s the life in my men. [To her maid] Beulah, peel me a grape. [Maid] Goodness, what beautiful diamonds! [West] Goodness had nothing to do with it. Give a man a free hand and he’ll try and put it all over you. If you haven’t got anything good to say about anyone come and sit by me. I’ve been rich and I’ve been poor: rich is better. I’m a Marxist--of the Groucho tendency. Suppose . . . that Lenin had died of typhus in Siberia in 1895 and Hitler had been killed on the western front in 1916. What would the twentieth century have looked like now? It makes one thoughtful reading about this while sailing in the North Atlantic, albeit well south of the iceberg line.